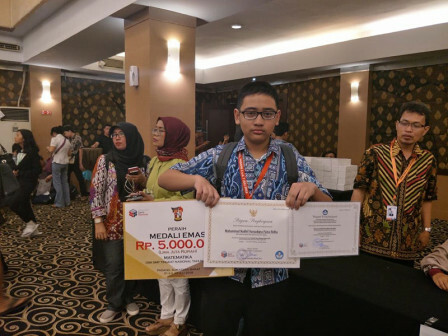 Jakarta Provincial Government becomes a Champion in National Science Olympiad (OSN). This achievement shows that Jakarta is managed to maintain its title as a champion which has been achieved last year.
" It will encourage Jakarta OSN team in giving the best work"
Jakarta contingents achieves 19 gold medals, 24 silver medals and 29 bronze medals in OSN 2018 held in Padang, West Sumatera on July 1-6. Acting Education Dept. Head, Bowo Irianto stated, this title can be achieved through hard work, motivation, and support from all sides. Especially mentors, teachers, parents, headmasters, coaches, and Jakarta Education Dept. officers. "It will encourage Jakarta OSN team in giving the best work," he conveyed, Saturday (7/7). He explained, tight selections are held in regions and provincial level to prepare Jakarta OSN team. Meanwhile, Merawati, mother of Made Ayu Utami, the student of SMA Negeri 21 Jakarta who has won a gold medal in Biology, expressed her gratitude for her daughter's success. "I am very grateful. I know her rival is tough. I thought she can only get a bronze" he mentioned. She added, her daughter now has a chance to join national training selection to represent Indonesia in International Biology Olympiad (IBO) because she have won a gold medal in OSN. "Made Ayu should join this international level training. I am very grateful for what she has achieved until now," she conveyed. For information, the 17th OSN has been participated by 1,433 best students in 28 provinces from elementary school, junior high school, and senior high school. They compete to be the best in 11 study fields in mathematics, natural sciences, social sciences, physics, biology, chemistry, computer science, earth science, astronomy, geography and economy.